I love summer, for us Mainers Lobster and Blueberries are summer treats. I hope you are all enjoying summer. This week my husband is on vacation so we are eating lobster, boating and eating blueberries in every form. I hope you like these recipes! 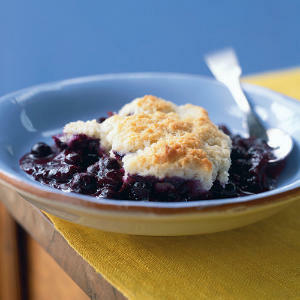 Let me know what your favorite blueberry recipes are, I love to try new things. Dust chicken breasts with Cajun spices. Sauté in olive oil until brown and almost cooked through, 7 to 10 minutes. (If thick, cover for 3 or 4 minutes more.) Remove chicken breasts from pan and keep warm. In same pan, sauté garlic and onion until transparent, scraping remaining bits of chicken from bottom of pan. Add red wine and cook down until most of the liquid is evaporated. Add Wild Blueberries, lemon rind and salt. (If blueberries are frozen, until berries are heated through.) Add salt and pepper to taste. Let sit for 5 minutes, heat off, for flavors to blend. Spoon over chicken breasts and serve. Hot, delicious fruit paired with ice cream―no wonder it’s an American favorite. Beginning as a variation on pies, cobblers date back to the 1850s. The traditional New England concoction used a thick, biscuit topping instead of pie pastry. You might not think of cobbler as heavy, but the typical topping contains ingredients like full-fat sour cream and whipping cream. Our switch to fat-free sour cream is undetectable (except in the nutritional profile). The new cobbler has just half the fat of the classic recipe but maintains great buttery flavor in the topping. To prepare topping, lightly spoon flour into dry measuring cups; level with a knife. Combine flour and next 4 ingredients (flour through baking soda) in a large bowl, stirring with a whisk. Cut in butter with a pastry blender or 2 knives until mixture resembles a coarse meal. Stir in sour cream to form a soft dough.